November 14, 2011 - In April 2010, Department of Transportation (DOT) put a three-hour tarmac delay rule in place to protect airline passengers. And more than a year later, as we head into the holiday travel season, DOT reports the rule is working to keep extended tarmac delays at a minimum. In the year before the rule went into effect, airlines reported 693 tarmac delays of more than three hours, and 105 of the delays were longer than four hours. But in the 12 months after the rule was enacted, there were only 20 reported tarmac delays of more than three hours, none of which was more than four hours long. However, these delays do still occur, and when they do, DOT will take any violation seriously. On Monday DOT announced the first fine for a violation of this important passenger protection. DOT has fined American Eagle $900,000 in civil penalties and has ordered the air carrier to cease and desist from future violations of the tarmac delay rule. On May 29, 2011, American Eagle had tarmac delays of more than three hours on 15 flights arriving at O?Hare. Those 15 flights had tarmac delays of up to 225 minutes, which was 45 minutes beyond the limit. A total of 608 passengers were aboard the affected flights. While the airline had a procedure in place to bring passengers subject to an extended tarmac delay back to the gate, the carrier was late in implementing its procedure, resulting in violations of the rule. A total of $650,000 must be paid within 30 days, and up to $250,000 can be credited for refunds, vouchers, and frequent flyer mile awards to the passengers on the 15 flights, as well as to passengers on future flights that experience lengthy tarmac delays of less than three hours. DOT Secretary of Transportation, Ray LaHood said ?I've said before that we think airline passengers deserve to be treated fairly--before, during, and after their flights. The tarmac delay rule and vigilant enforcement by DOT are critical steps toward ensuring they are. The rule is working; passengers are being protected. 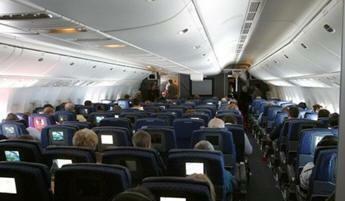 I hope that can be one less source of stress for air travelers this holiday season?. Airline Tarmac Delays rule prohibits U.S. airlines operating domestic flights from permitting an aircraft to remain on the tarmac for more than three hours without deplaning passengers, with exceptions allowed only for safety or security or if air traffic control advises the pilot in command that returning to the terminal would disrupt airport operations. U.S. carriers operating international flights departing from or arriving in the United States must specify, in advance, their own time limits for deplaning passengers, with the same exceptions applicable. Carriers are required to provide adequate food and potable drinking water for passengers within two hours of the aircraft being delayed on the tarmac and to maintain operable lavatories and, if necessary, provide medical attention.
? Prohibits airlines from retroactively applying material changes to their contracts of carriage that could have a negative impact on consumers who already have purchased tickets.